Tue., 24 Sep. - Mon., 7 Oct. Mon., 30 Sep. - Tue., 22 Oct.
Fri., 27 Sep. - Wed., 15 Jan. Mon., 27 May - Thu., 13 Jun. Wed., 25 Sep. - Wed., 15 Jan. Mon., 21 Oct. - Fri., 8 Nov. Tue., 5 Nov. - Tue., 3 Dec.
Fri., 17 May - Tue., 11 Jun. Sun., 2 Jun. - Tue., 18 Jun. Wed., 2 Oct. - Wed., 23 Oct.
Wed., 22 May - Mon., 24 Jun. Wed., 16 Oct. - Fri., 25 Oct.
Fri., 3 May - Thu., 6 Jun. Mon., 7 Oct. - Mon., 18 Nov.
Wed., 22 Jan. - Sat., 1 Feb. Tue., 21 Jan. - Sat., 1 Feb. Located in Racha Thewa, this hotel is 0.6 mi (1 km) from Wat Kingkaew and within 6 mi (10 km) of The Paseo Mall and Market Village Suvarnabhumi. Mega Bangna and Huachiew Chalermprakiet University are also within 9 mi (15 km). 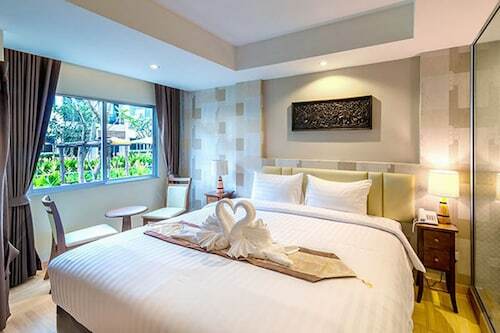 Located in Lat Krabang, this hotel is within 1 mi (2 km) of Marketland and The Paseo Mall. Bangkok Suvarnabhumi University and Wat Kingkaew are also within 6 mi (10 km). 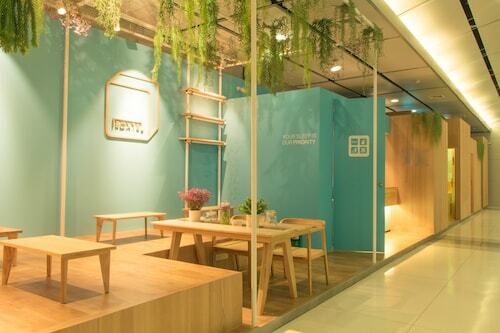 Situated in Bang Phli, this hotel is within 9 mi (15 km) of Marketland, The Paseo Mall, and Wat Kingkaew. Huachiew Chalermprakiet University and Samitivej Srinakarin Hospital are also within 12 mi (20 km). Suvarnabhumi Airport Station is only a 2-minute walk. Situated near the airport, this hostel is within 9 mi (15 km) of Marketland, The Paseo Mall, and Wat Kingkaew. Huachiew Chalermprakiet University and Samitivej Srinakarin Hospital are also within 12 mi (20 km). Suvarnabhumi Airport Station is 24 minutes by foot. This family-friendly Bang Phli hotel is located near the airport, within 3 mi (5 km) of Market Village Suvarnabhumi and Wat Kingkaew. Mega Bangna and Huachiew Chalermprakiet University are also within 6 mi (10 km). 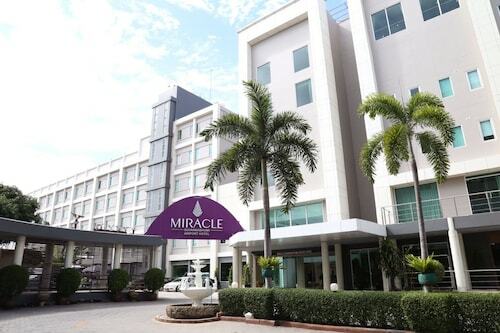 Situated near the airport, this hotel is within 9 mi (15 km) of Marketland, The Paseo Mall, and Wat Kingkaew. Siam Park City and The Mall Bangkapi are also within 12 mi (20 km). Suvarnabhumi Airport Station is only a 4-minute walk. 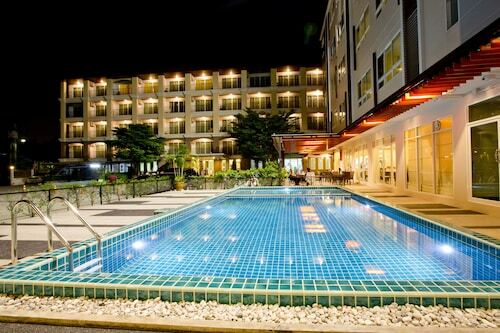 Located in Racha Thewa, this hotel is 0.8 mi (1.3 km) from Marketland and 1.5 mi (2.5 km) from The Paseo Mall. Wat Kingkaew is 3.1 mi (5 km) away. Question : How long do most people stay on their visit to Bangkok? Answer : Of course, you are not most people, but if you were, you'd stay around 16 days. Question : How much is a plane ticket to Bangkok (BKK) from Calgary (YYC)? Answer : Cost can range anywhere from $832 to $6,349, prices for YYC to BKK do fluctuate a lot more than the majority of routes from Canada. 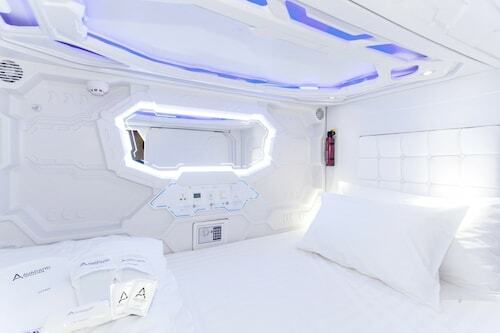 Remember, the sooner you book, the better price you tend to get. Answer : The cheapest day to fly from Calgary to Bangkok is on Tuesday. If you want to save a little money on your next getaway look for flights on Tuesday. Question : What is the cheapest airline flying from Calgary to Bangkok? Answer : Ticket costs are hitting highs of $6,349 over the next three months when flying to BKK from YYC. Check out ANA, as customers have been buying tickets at just $832. Question : What is the cheapest date to fly to Bangkok? Answer : As of Apr 22nd, the best day for booking to Bangkok (BKK) is May 14th. Your ticket will cost $922, which is 55% less than this route's average price. Answer : Yes, you can change your departure or arrival date. If you would like to save a little money in doing so, the cheapest day to fly in May is Tuesday. 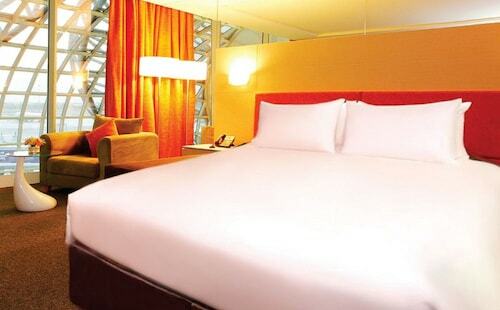 Being flexible with your travel days can provide you extra savings when booking.